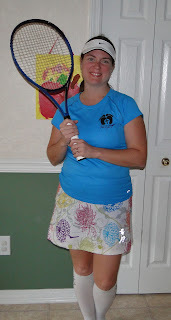 Road Runner Girl: Long Run a Day Early and Tennis! As most of you know I am camping this weekend with my family for the boys' cub scouts. Hopefully I am surviving and no creatures have gotten me lol! 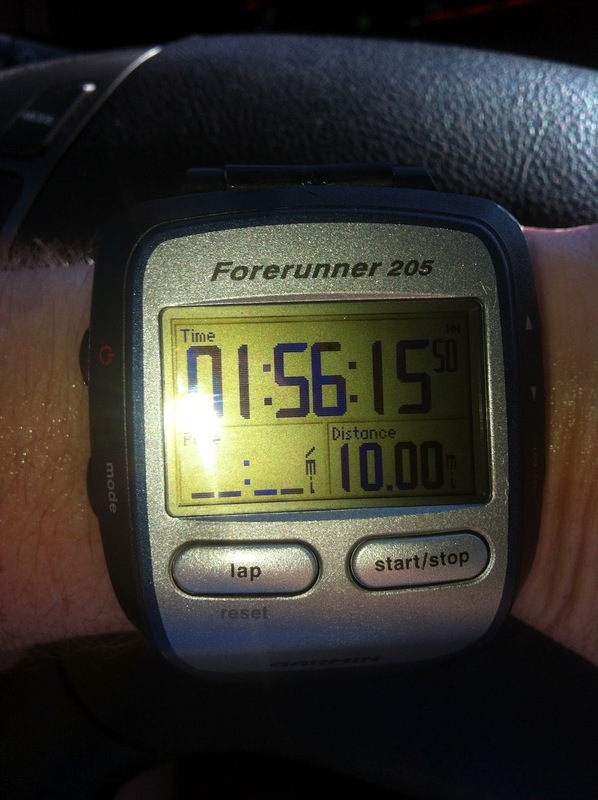 Because of the camping trip I had to do my long run a day early on Friday. 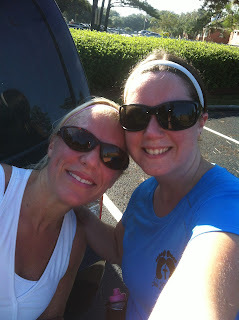 I got to run with my friend Paige who I haven't ran with in forever! We had the best time! The run was hard...don't know why we chose a hilly route after we ran that hilly half marathon last weekend...but we did it! Here's us at our last water stop at mile 7! There was one bad thing that happened during our run. I'm not sure how everyone else does it but when we run long runs we drop water on the route so that we can stop and refill our water bottles in our fuel belts. Paige dropped the water today...she said some ladies looked at her funny when she was putting the plastic bag with two waters in it on the ground near the road behind some monkey grass. She told them we were running and we would pick up our bag of water about two hours later. They said ok. Well...guess what happened??? When we made it to the water stop...our bag of water was not there!!! And there was a wet spot on the road where it looked like someone had poured out the water!!! After looking around we saw our bag and the EMPTY water bottles in a recycle bin not far from where we had stashed our water. Are you kidding me??? I have been running and dropping water for almost three years and no one has EVER messed with my water much less poured it out!!! I was furious!!! Paige didn't have her water belt so she had no water at all! And it was hot! I only had a sip left in mine...of course I gave that sip to Paige. But it got me thinking...how can someone be so inconsiderate??? They knew we were coming back to get it. I couldn't believe they would be so mean!!! Has this kind of thing every happened to any of you??? After we finished our run we headed for tennis lessons! Yes...I said tennis lessons! A bunch of my running friends are taking lessons and this was the first week. I used to play tennis in high school but I was horrible at it. I loved it though. So hopefully I can learn to play better! We had so much fun at the lesson! He taught us about our tennis racket and how to hold it for different playing positions. I had no clue you hold your racket differently for volleys than you do for forearm and backhand! But your hand actually grips the racket in a different place for each of these. We practiced hitting forearm volleys, backhand volleys, and forearm shots. Then we did an exercise where we hit a forearm shot, ran to the net and hit a forearm volley, and then a backhand volley. Then we had to run up to the net and touch it and run to the back of the line. It was so much fun!!! I can't wait to go back next week! 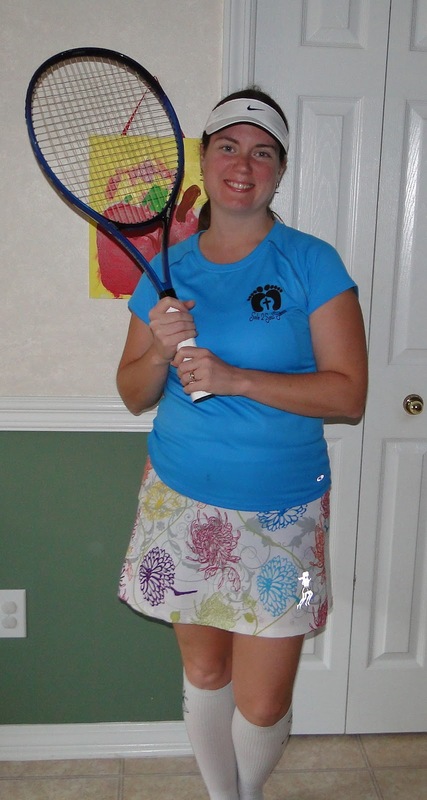 QOTD: Do you or have you ever played tennis? Give me some pointers!